I grew up in Cleveland, Ohio. I was always fascinated by nature and played in the creek and hiked the woods that ran through the ravine in our backyard. Thank goodness my parents loved nature as well because everything I collected came home. As a child I watched in wonder as my mother designed and made beautiful couture gowns and suits. She taught me to sew at an early age and fabric and all that goes with it is one of my earliest childhood memories. Having always loved working with textiles, exotic yarns and threads it was only natural to make the leap and become a fiber artist. I graduated from Shaker Heights High School where I started life as an art major and fell in love with biology. After creating my portfolio and applying to art schools, I changed my mind; much to the chagrin of my art teacher Mr. Jeffrey. I knew that I wanted to teach from the time I was five years old, I just thought it would be art not biology. I attended Duquesne University in Pittsburgh, Pennsylvania where I earned a degree in Secondary Education with a major in Biology. I moved to Florida in 1970 and began my teaching career which lasted 18 years. 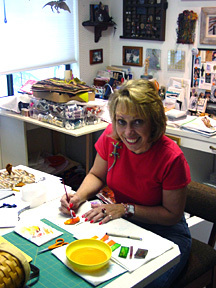 I never stopped drawing, painting or sewing. Then I took a Beginning Quilting Class in 1979. I fell for it "hook, line and sinker". Although I started as a traditional quilter I soon found that too restrictive. I began creating my own designs. More and more my work came back to nature as my inspiration for design. My daughter Megan and I live in Cooper City, Florida with our five cats. I grow orchids as a hobby and I have recently started creating exotic jewelry from natural stones of course.